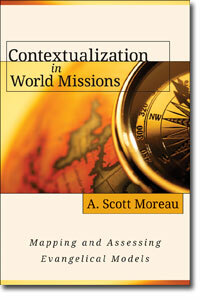 A. Scot Moreau, Contextualization in World Missions: Mapping and Assessing Evangelical Models (Grand Rapids: Kregel, 2012). A. Scot Moreau is Professor of Intercultural Studies at Wheaton College, a former missionary in Africa, and the author of numerous articles on missions in journals and books. Moreau’s book might be better titled “Everything You Ever Wanted to Know about Contextualization but Were Afraid to Ask.” Contextualization, a term which entered the missional context in 1972, is defined by Moreau as “the process whereby Christians adapt the whole of the Christian faith (forms, content, and praxis) in diverse cultural settings” (p. 46). By way of overview, this book consists of 14 chapters and six appendices. The major content is divided into two major sections. The first section addresses the foundations for evangelical contextualization. The second, and larger, section maps out evangelical models for contextualization. The book is not light reading and clocks in at 429 pages. Each chapter is helpfully organized with an overview, chapter outline, main body, definitions of keywords, and questions for reflection. There are also numerous charts and diagrams. Moreau’s attention to detail is obvious. There is much to like and to learn here. The challenge for many readers not already familiar with missiology in general and contextualization in particular is the breadth and depth of this work. As already noted, Moreau tries to make this work reader-friendly, but although I have a working familiarity with the issues, I still found it a bit overwhelming at times. I also wish that there had been more interaction with the Bible and theology, but the author makes it clear that he has taken a different approach. So this is more of an expression of personal preference than a criticism. Overall, Contextualization in World Missions provides a major contribution to the study of missiology and contextualization. If either is one’s area of study or interest, then there is a wealth of information to be found here. Readers with less interest or exposure to the discussion will likely find the book a bit much. In any case, you can read an excerpt here. Thanks to Kregel for providing this free review copy.